The Sand Creek Battle, or Massacre, occurred on November 29-30, 1864, a confrontation between Cheyenne and Arapaho Indians and Colorado volunteer soldiers. The affair was a tragic event in American history, and what occurred there continues to be hotly contested. Indeed, labeling it a “battle” or a “massacre” will likely start an argument before any discussion on the merits even begins. Even questions about who owns the story, and how it should be told, are up for debate. Many questions arise whenever Sand Creek is discussed: were the Indians peaceful? Did they hold white prisoners? Were they under army protection? Were excessive numbers of women and children killed, and were bodies mutilated? Did the Indians fly an American flag? Did the chiefs die stoically in front of their tipis? Were white scalps found in the village? Three hearings were conducted, and there seems to be an overabundance of evidence from which to answer these and other questions. Unfortunately, the evidence only muddies the issues. Award-winning Indian Wars author Gregory Michno divides his study into three sections. The first, “In Blood,” details the events of November 29 and 30, 1864, in what is surely the most comprehensive account published to date. The second section, “In Court,” focuses on the three investigations into the affair, illustrates some of the biases involved, and presents some of the contradictory testimony. The third and final section, “The End of History,” shows the utter impossibility of sorting fact from fiction. Using Sand Creek as well as contemporary examples, Michno examines the evidence of eyewitnesses all of whom were subject to false memories, implanted memories, leading questions, prejudice, self-interest, motivated reasoning, social, cultural, and political mores, an over-active amygdala, and a brain that had a “mind” of its own―obstacles that make factual accuracy an illusion. Living in a postmodern world of relativism suggests that all history is subject to the fancies and foibles of individual bias. The example of Sand Creek illustrates why we may be witnessing “the end of history.” Studying Sand Creek exposes our prejudices because facts will not change our minds we invent them in our memories, we are poor eyewitnesses, we follow the leader, we are slaves to our preconceptions, and assuredly we never let truth get in the way of what we already think, feel, or even hope. We do not believe what we see; instead, we see what we believe. Michno’s extensive research includes primary and select secondary studies, including recollections, archival accounts, newspapers, diaries, and other original records. 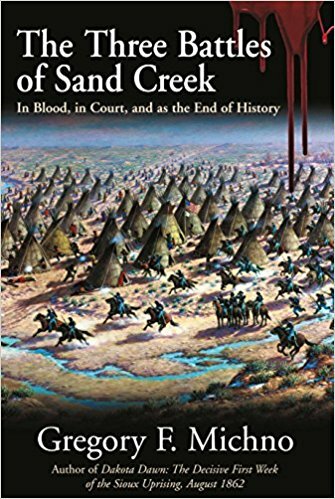 The Three Battles of Sand Creek will take its place as the definitive account of this previously misunderstood, and tragic, event.